It’s a week before your big 25th wedding anniversary, and you’re on the hunt for the perfect gift for your beloved wife. You’ve been listening for hints of something she would really love, but because she’s the wonderful, selfless person that she is, that’s been a bit difficult task all your life. However, she has mentioned several times while getting ready for work that she wishes there was a mirror in your bedroom. Using the one in the bathroom has been quite a task since the two of you share a single bathroom with your three teenage daughters. Now, where in the world does one go shopping for the perfect bedroom mirror? 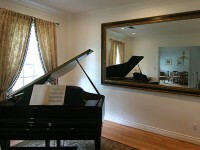 If you’re looking for framed mirrors in Dallas that are quality built and look amazing, look no further than your internet connected device. Shop for a custom framed mirror online, on a website that gives you the very best, highest quality options for custom framing that features intricate, stylish designs. If you know your wife enjoys a particular style of furniture, you can choose to look at a collection of mirrors featuring that specific style. For example, if she likes the look of rustic furniture, start your search by looking through the rustic collection of mirrors. You can even choose to shop by the color of mirror you think she’d prefer. Start by choosing the type of mirror you think she’d prefer. 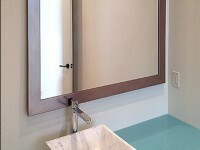 There are wall mirrors, floor mirrors, dressing mirrors, and more. Next, you’ll choose a frame, and there are quite literally hundreds of stunning framing options to choose from. Then you’ll move on to the style of mirror that you think your wife would most enjoy. From there, you can choose your glass option, installation option, and place your order. It’s simple, and you can really surprise your love by putting so much thought into the customization project. But if you’re really unsure about what she’d like, consider letting her choose for herself. Think about it; when was the last time she bought anything special for herself? The answer is never. Your wife spends every moment of every day taking care of your children and you and the house, and the list goes on and on. All she ever cares about is that everyone else is taken care of. This is the perfect opportunity for you to spoil her with something truly special. If you’d rather order the mirror in person with some assistance, you can make an appointment to do just that. This is a gift that will truly keep on giving, so you want to make your choice wisely. Shop for a custom framed mirrors in Dallas that your wife will absolutely love, and you know just how excited she’ll be that you were listening to her and are putting so much thought into this gift. Whether you choose to pick one out and surprise her, or you sit her down in front of the computer and let her custom design her own, she’s sure to remember this anniversary gift each and every morning when she gets out of bed and sees her beautiful, elegant mirror.